While career NFL players aren't necessarily dying younger, they are getting diseases like ALS at much higher rates. With the Super Bowl just days away, new data adds to the evidence linking violent on-field collisions with an increased risk of acquiring a neurodegenerative disease later in life. The results were part of a study published in JAMA designed to resolve a paradox about the relative health of NFL players. On one hand, there have been a rash of reports since 2009 linking repetitive hits to the head and various neurodegenerative diseases. On the other, studies have shown that NFL players tend to live longer than people in the general population. Atheendar Venkataramani, a professor of medical ethics and policy at the University of Pennsylvania and lead author of the JAMA paper, wondered if the paradox wasn't caused by a faulty comparison between superhuman NFL athletes and regular people. "Career NFL players are incredibly well-trained athletes who are playing a sport that's very unique in terms of its physical demands," Venkataramani told Seeker. "In order to be successful and have a career in pro football, you have to be super healthy." Venkataramani and his colleagues went looking for a more "apples to apples" comparison and found it in a historical oddity: NFL replacement players. In 1987, there was a players strike in the NFL, and for three weeks, team owners enlisted replacement players culled from former college athletes who hadn't quite made the pros. After those three brief weeks in the limelight, the replacement players hung up their NFL jerseys and went back to real life. For the Penn researchers, this was a data goldmine. First, all the 1987 replacement players names were readily available online. Second, the replacement players and former career NFL players shared just about everything in common - past football-playing experience, age, weight, and body mass index. The did not share, however, the same amount of time playing in the NFL. By comparing their long-term health outcomes and mortality, the researchers figured, they could isolate the true health impact of an NFL career. On the surface, the results look unremarkable. Thirty years after that 1987 season, almost the same exact percentage of former career NFL players and replacement players had died. Of the 2,933 career NFL players followed in the study, 144 (4.9 percent) were deceased. Of the 879 replacement players identified, 37 (4.2 percent) had passed away. A more in-depth statistical analysis revealed that career players had a 38 percent higher relative risk of death compared to the replacement players, but even that number isn't statistically relevant, explained Venkataramani, because the sample size and total number of death events were so small. But when researchers broke down the deaths by cause, one "score" stood out: seven to zero. Among the former NFL players, seven had died from amyotrophic lateral sclerosis (ALS), the crippling motor neuron disease, also known as Lou Gehrig's disease. None of the former replacement players were struck with ALS. Steven DeKosky is the deputy director of the McKnight Brain Institute at the University of Florida College of Medicine, where he's also a professor of Alzheimer's research. He co-authored an editorial in JAMA about the replacement player study. "The prevalence of ALS in the general US population is around five cases per 100,000," DeKosky told Seeker. "Here's a case where there's about 3,000 people and there's seven cases. It's almost a 200-time greater prevalence in the career NFL players than in the general population. Clearly something about the experience is increasing your chances of getting ALS, even though they're still low." DeKosky is quick to point out that the majority of former NFL players suffer no long-term neurological side effects from their playing days. Still, a growing body of research has shown that repeated blows to the head do increase the risk of acquiring ALS and Alzheimer's and are the sole cause of chronic traumatic encephalopathy, formerly known as punch drunk syndrome. The question raised by the new study and others is why do some former NFL players get these neurodegenerative diseases while most others don't? DeKosky believes that if researchers can identify the genetic or environmental differences between former pro players who developed disorders and those who didn't, it could potentially lead to targeted therapies not only for athletes, but for everyone who is vulnerable to the same neurological conditions. "You gather those eight to 10 cases and do gene sequencing and find out that they have genes that are uncommon variants from athletes who played football but didn't get it," said DeKosky. "If you isolate the protein or the enzyme that they have that's different and makes them more vulnerable, we could go after that with a therapy." Venkataramani points out that larger and longer-term studies may still show a negative difference in the health outcomes of NFL players versus the general public. The oldest players in his cohort were only in their mid-50s, still too young for most types of dementia to present themselves. Those seven ALS cases, although statistically small, may be portents of worse news to come. 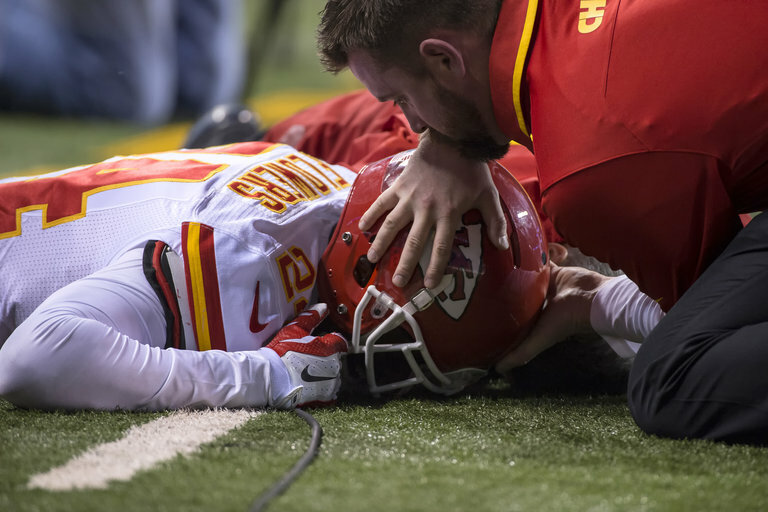 WATCH: Concussions in Football: What Can Be Done?